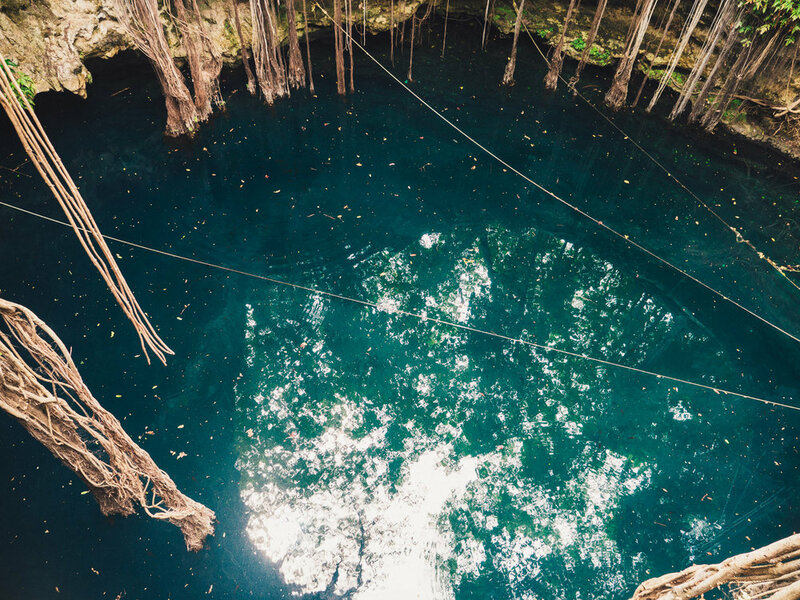 Cenotes are natural, crater-like, pools which are sourced from underneath ground water. You'll find them in all shapes and forms, often they are much larger under water than you would see at first glance. They are one of the reasons to visit Yucatan because there are many of them, scattered over the rainforest. Probably there are many more hidden and undiscovered. The old Mayan ruins are often found near cenotes because they provided the people to fresh, sweet water. Therefor most cenotes still have Mayan names. I've visited a few, and probably the most pretty one I've seen is the Lol-ha cenote (photo above) in the middle of a little village Yaxuna. Because it's not on the usual tourist route, there are barely people visiting it. A dive from the edge is about 9 meters, then below the surface there is 16 meters of water at its deepest point. Because most cenotes are quite deep, the water is crystal clear, and refreshingly cold. Great for a quick dip during a hot day of cycling. I avoided the crowded cenotes where tourbusses stop, like the well known Ik Kil cenote, near the famous Maya temple of Chichen Itza. So many people visit this place every day, that the water gets dirty from all the sunscreen and bug reppelent. Also around Tulum in the east of the penisula, there are many cenotes, some very small ones, with several holes in the rock surface where you can jump through. Probably my best experience was discovering a small cenote along the highway out of Merida during midday. Days on the road seem extra long because the scenery around barely changes. When there is nowhere to hide from the sun the humid weather of the low lands wears you out , so this was a welcome break. I spend there 2 hours until the temperatures dropped a bit and the sun sat lower in the sky, before going back on the road.